Time to pull it all together with some slow-cooked pork carnitas finished under the broiler for extra flavor and a bit of crisp. This taco, with homemade corn tortillas and fresh garnishes, really fits the bill. 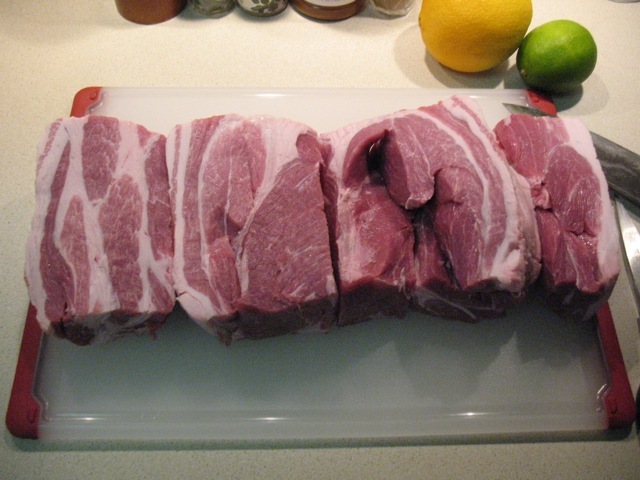 This is the pork shoulder cut into four large pieces. Strips of fat thicker than 1/8 inch should be trimmed off. For months, I've been thinking about trying my hand at making such a taco myself. I already knew how to make guacamole and, although I have roasted pork shoulder, I haven't actually attempted carnitas, nor have I ever made tortillas. 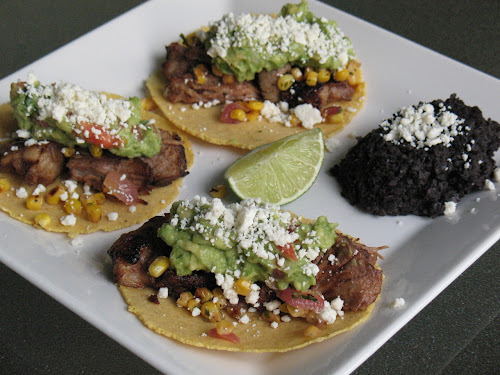 So this was a dish that required some research and an allotment of time that would allow me to slow-cook the pork and finish it in the oven, while also making the tortillas, garnishes, and refried black beans, all washed down with some cold margaritas. Everything goes into the slow cooker. The recipe I turned to for the meat was from America's Test Kitchen, although I adapted the recipe by making the dish in a slow cooker rather than the oven. This lengthens the cooking time significantly; however, it kept my kitchen from getting really hot (and I was making this during the recent 100-degree heat wave) and it gave me extra time to get all those other dishes done. Because I used the slow cooker, I omitted the orange peels and used orange zest instead. I also upped the amount of oregano and cumin, since I really like those flavors. As the carnitas cooking liquid reduces, thick solids will form. Be careful not to burn them, as they are full of flavor for coating the meat before broiling it. I found the meat a bit difficult to shred. Some of it shredded fine, but other pieces were really difficult. I'm not sure if it was because those were sections of leaner meat, I cooked it too long, or I just didn't employ a good shredding technique. Eventually, I got the chunks down to manageable pieces, but it took a great deal of effort. Out of the broiler on a cooling rack fitted into a half sheet pan. The special touch to this recipe is the final broil in the oven. The cooking liquid is first reduced down to just a cup, a process that takes awhile since you start with about 3-4 cups of liquid. Once thickened, the sauce is tossed with the cooked, shredded meat and then broiled on a rack in the oven, with the rack positioned at the lowest third toward the bottom of the oven (yes, this is far away for broiling, but you don't want to cook the meat much more, just dry it out a bit to make it a little crispy). The equipment I used for this was a cooling rack sized to fit inside a standard half baking sheet (13 X 18). This allows some of the fat from the reduced sauce to drip off the meat. 1. 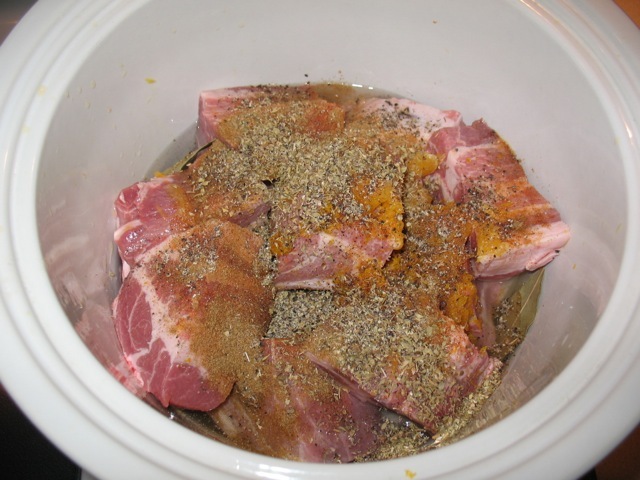 Add all ingredients through the orange to the bowl of a slow cooker. Cook on the low setting for about 7 hours until the meat is tender and cooked through (USDA's safe cooking temperature for pork is at least 145 F). Alternatively, combine ingredients in a dutch oven, heat on the stove until they start to simmer, then roast, covered, in a 300 F oven for 1 hour. 2. 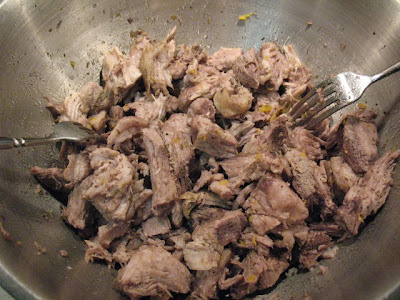 Transfer the pork to a bowl. Strain the liquid, discarding the large solids. 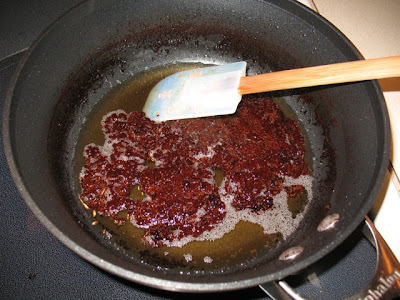 Add liquid to a medium sauce pan and boil until reduced to 1 cup (sauce will be significantly thicker and a bit bubbly). 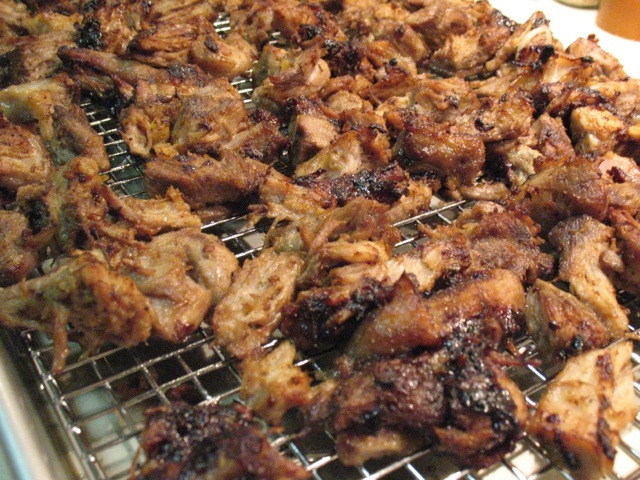 While it is cooking, use two forks to shred the pork, breaking each large piece of pork into 3-4 smaller pieces (or smaller). 3. Position oven rack about a third of the way from the bottom of the oven. Turn on broiler to heat oven. Pour reduced liquid over shredded pork and stir to coat. Position a cooling rack above a half baking sheet (13 X 18). Spread meat evening on top of rack. Broil meat in oven for about 7-8 minutes until well browned. 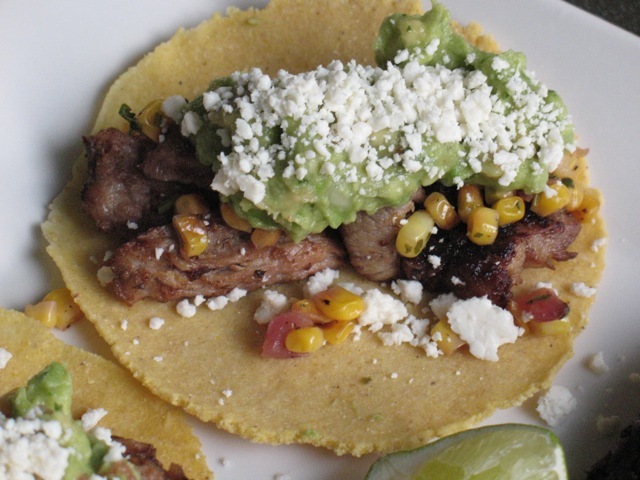 Serve with tortillas, corn salsa, guacamole, crumbled cheese and lime wedges (or other garnishes you like, such as shredded radishes, pico de gallo, sour cream, etc.). These were delicious! I didn't appreciate how much work they were until I read this post. Thank you for making the effort!